The entire World must understand: Bolivian citizens are fighting for their democratic liberties! It is our right to protect the Referendum of February 21, 2016, where we said NO more evo and acolytes. Enough with corruption, waste of funds, narcotraffick, smuggling, chaos, anarchy! The above opinion was made by Bolivian Thoughts. Citizen organizations such as Generation 21 [Generación 21], Bolivia I Promise [Me Comprometo Bolivia] and The Streets Bolivia [Las Calles Bolivia] aim to demand respect for the results of 21F in the official parades, despite the warnings from social organizations. They will also be in Ocureña and the Military Parade. The month of August began with demonstrations by Comcipo and platforms such as Las Calles Bolivia in Potosí. 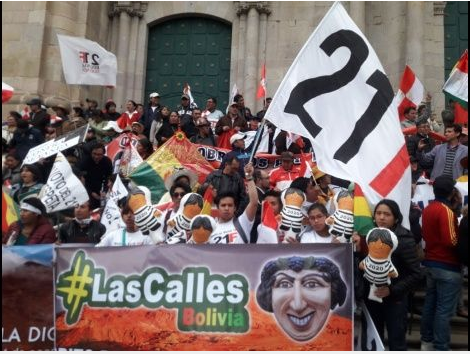 The citizen platforms aim to show their power of convocation in the central acts for August 6 in Potosí, where President Evo Morales will be, and also in other departments of the country to demand respect for the results of 21F and shout: Bolivia said No. This was made known to spokesmen and coordinators of the different organizations consulted via telephone by EL DEBER. Rodo Rivas, national coordinator of Generation 21, explained that they have presence in the nine departments of the country to mobilize during the National Holidays and demand the fulfillment of the results of the referendum of February 21, 2016, when the No to the re-election of President Morales won. “It was defined that those who can not go to Potosí will do acts of protest in their departments. The strategy is to lead the parades with the FRIENDLY civic committees, we will be inside the parades, also along the caravan,” he explained, in telephone contact with EL DEBER. Rivas indicated that they were not accredited as platforms to parade in the official events in Potosí and the other cities, but they are looking for friendly institutions to go along with them, identified with t-shirts, banners and 21F flags. On the warnings of the social organizations to respond to any provocation, the activist said that they are based on the guarantees given by the Constitution and clarified that their mobilizations are peaceful. The demonstrations for 21F are confirmed in Santa Cruz, Cochabamba, Oruro and La Paz. In Beni, Sucre, Tarija and Pando are still refining. Jose Manuel Ormachea, from Bolivia I Promise, indicated that La Paz will be present at all official events and August 6 will not be the exception. They will demonstrate in the civic parade organized by the city of La Paz and also announced that they will be at the inauguration of the Casa del Pueblo on August 9. Today, they made themselves heard at the inauguration of the new Banco Unión building and indicated that this is why the president of the country did not attend the event, although his presence was not confirmed. Also in La Paz, Juan Víctor Corico, from Generación 21, explained that they are coordinating with El Alto to demonstrate in strategic places at the government headquarters. In Cochabamba, where official acts will be held for the enactment of the Law of Agrarian Reform and the Military Parade, Ariel Lizarazu, coordinator of Las Calles Bolivia, confirmed that they will attend with a large delegation to both events and also invited to join the rest of the Cochabamba population. For his part, Rubén Peña, from Me Comprometo Bolivia, explained that it will seek to position a positive message in the demonstration in Santa Cruz, that is to say that 21F is equal to justice, respecting the rules, inclusion. The parade will be held on August 5 at the Cambodromo, starting at 7:00 p.m. Finally, Ricardo Gutiérrez, from the same organization as Peña, said that in Trinidad the activities to be carried out are being refined with the other platforms. “If there is something, it is being planned, yes it will be added to the other demonstrations … Between now and tomorrow the measures will be defined,” he said. This entry was posted in Beni, Bolivia, Cochabamba, La Paz, Politics, Potosi, Santa Cruz, Social Unrest and tagged Chuquisaca, Coalition for Democracy, democracy in peril, government failures, Oruro, Pando, rights, Tarija. Bookmark the permalink.